The National Thoroughbred Racing Association (NTRA), Daily Racing Form and the National Turf Writers and Broadcasters (NTWAB) announced today that Michael Clevenger, veteran photographer of the Louisville Courier-Journal, has won a 2015 Media Eclipse Award for Photography for his picture of American Pharoah winning last year’s Belmont Stakes and becoming Thoroughbred racing’s 12th Triple Crown winner. 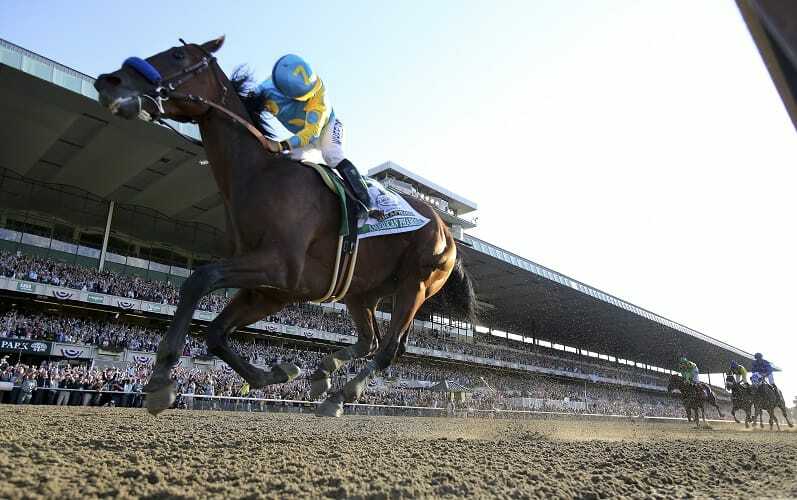 Clevenger’s photo, from the inside rail at Belmont Park, captures American Pharoah’s jockey, Victor Espinoza, peeking over his shoulder to see the field behind him, as the 3-year-old colt crossed the finish line with the Belmont Park stands packed with 90,000 fans roaring in jubilation at the achievement of the first Triple Crown in 37 years. The photo appeared in the Courier-Journal on June 7 of last year. This is the third Photography Eclipse Award for Clevenger, who also won the honor in 2002 and in 2010 for photographs which were published in the Courier-Journal. Clevenger will be honored along with Scott Serio, who also won a 2015 Media Eclipse Award for Photography for his photograph of American Pharoah working out on the Keeneland training track in preparation for last year’s Breeders’ Cup Classic. Clevenger’s photo was submitted for the contest in good order before the deadline but was inadvertently not passed on to the judges. Last week, the Eclipse Awards Steering Committee convened the photography judges in the competition to review the photograph, and it was determined that Clevenger’s photo should be honored along with Serio’s submission.